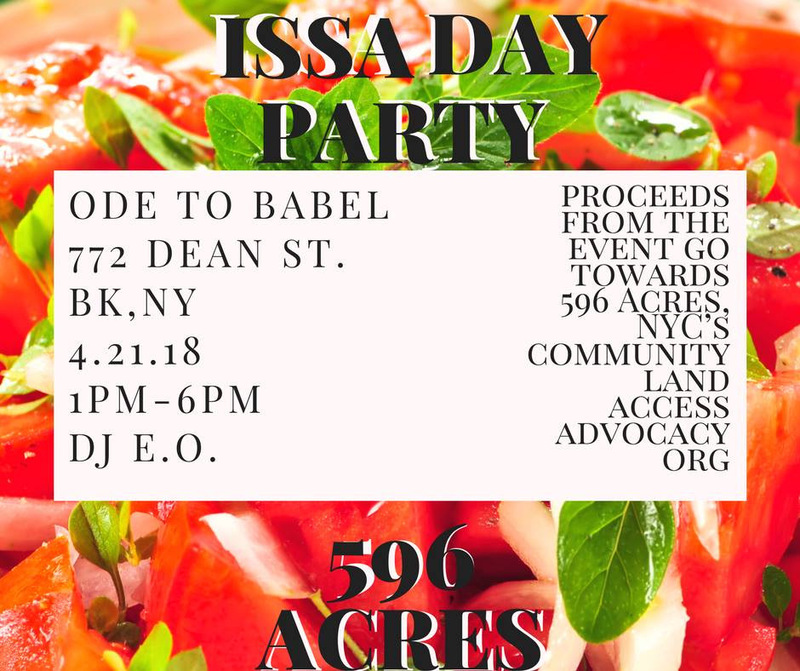 Day Party on Saturday: We’re partnering with Ode to Babel (772 Dean St at Washington Ave, Crown Heights) to bring you a day party fundraiser this Saturday, April 21 from 1pm to 6pm! Proceeds will go directly to 596 Acres. Join us! Event information here, facebook event here, and flier with more info at the bottom of the newsletter. Become a monthly donor here. 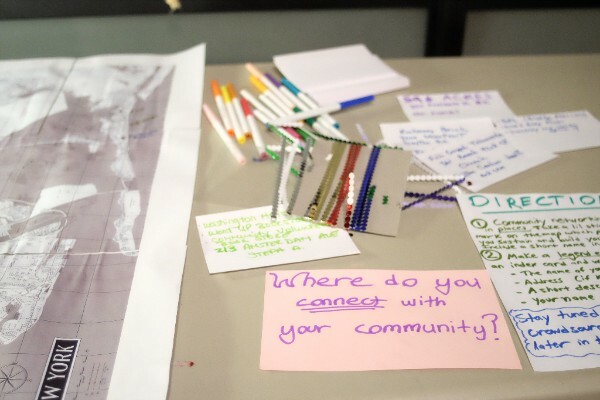 Sign Making on Sunday: Join us at Earth Arts Center (936 Madison Street at Broadway, Bushwick) this Sunday, April 22 at 5pm til 11pm for community land access organizing and making signs! Photo above from our last one. Event info here and facebook event for Earth Arts’ day-long Ethnobotanical Festival, Sowing a Regenerative Resistance, here. On Saturday May 12, we are partnering with Bronx Community Health Network to kick off Bronx Health Week at Poe Park with a Mother’s Day Salsa Dance Party! We will be tabling and sharing information to support local advocacy to reopen the Poe Park Bandshell. Event info here. Get some of the backstory about the bandshell plus sign up to Organize on the living lots page here. #ProtectOurPlaces is going strong: Since the start of the outreach period this February, 89 places that recently got tax exemptions as charity-owned community properties have been removed from the tax lien sale list. 297 places remain at risk of having debt sold to private collectors (see a map and help with outreach here). Thanks to our coalition members, including the students at City College who are calling folks every day to help them protect their places by the May 17 deadline! In addition to this approach, the coalition is working with Council Member Reynoso to pass the #ProtectOurPlaces legislation before the summer 2018 sale. Thank you to Council Members Debi Rose, Ben Kallos, and Rafael Espinal for joining Helen Rosenthal in cosponsoring this bill this week! We need your help getting more council members to cosponsor the legislation (instructions here). Read more about this issue, boost our #protectourplaces Instagram posts, and reply to this email to join the coalition. 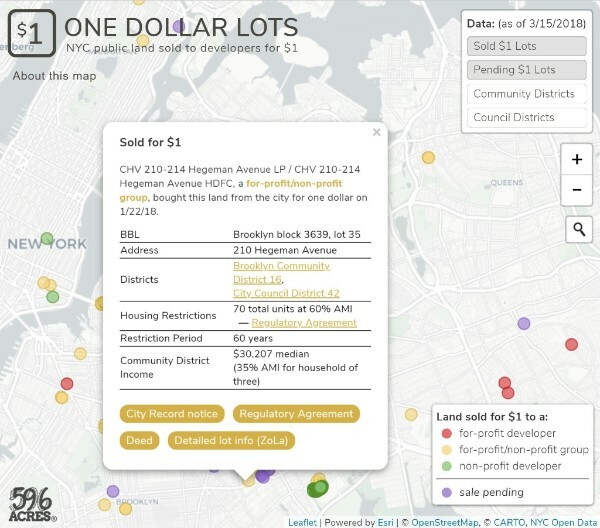 One Dollar Lots is ruffling feathers as NYers find out about the City’s 208 $1 public land sales since 2014. Check the map at onedollarlots.org. These sales are currently pending; reply to this email if you live nearby and want more information, and/or to testify at a hearing! And remember, dollar sales of long abandoned city-owned land are also a potential pathway to create the permanently affordable, community-driven solutions to NYC’s space crises that we need. More under Doing Better here. Bedstuy, Brooklyn – Join Patchen Community Square (Patchen and Putnam) for the first garden meeting of the season tonight, Wednesday, April 18, 6pm at Bailey’s Cafe (324 Malcolm X Boulevard at Decatur). Connect with the garden here. Bedstuy, Brooklyn – Join Myrtle Village Green for their garden meeting tomorrow, Thursday, April 19 at 6:30pm in the garden at Myrtle and Kent. Check out the beautiful community hub neighbors made out of a vacant city-owned lot. Connect online here. Flatbush, Brooklyn – Q Gardens (on formerly vacant MTA land near the Church Ave stop on the B/Q) is hosting Blunt Ensemble’s all-women workshop production of Richard III, a free performance this Saturday, April 21 at 5pm (flier here). They’re hosting a Haitian herb workshop and live music, presented in collaboration with Haiti Cultural Exchange, next Saturday, April 28 at 1pm (flier here). Connect with garden members here. Ozone Park, Queens – Join Pitkin 87 Community Garden for four garden planning meetings: tomorrow, Thursday, April 19, next Thursday, April 26, next Wednesday, April 27, plus one in May (flier here). They’re 7:30pm in the basement of Nativity Church (101-41 91st St. corner of Rockaway Blvd). 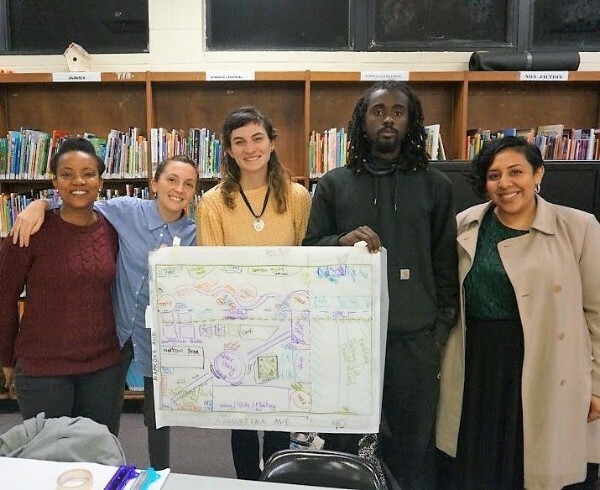 They seek support and feedback from neighbors about the future of the garden at Pitkin and 87th Street! Connect here. Long Island City, Queens – Pick up a free tree for Earth Day Weekend at Smiling Hogshead Ranch (25-30 Skillman Ave) this Saturday, April 21 from 12pm to 2pm. Details on getting your free tree here. Dig in on Bed Prep Work Day next Monday, April 23 from 11am to 4pm and on Planting Day 2018 next Saturday, April 28 from 11am to 6pm. Connect with the farm here. Harlem, Manhattan – Weather permitting, Mandela Community Garden, the wildflower meadow that neighbors made out of a vacant lot on West 126th street between Frederick Douglass and ACP, will be coming together to unload a delivery of earth from GreenThumb tomorrow, Thursday, April 19 between 8:30am and 10am. Help if you can! And stop by during open hours this Saturday, April 21 at 1:30pm. Subscribe to their newsletter here. Soul Fire Farm seeks a Booking Coordinator for Speaking Engagements, Workshops, and On-Farm Programs: 10 hours/week remote, flexible hours. $15/hour as independent contractor, with option to become employee. To apply, send cover letter, resume, and contact info for two references to love@soulfirefarm.org. The interview will consist of a brief performance task and a video conference conversation, and start as soon as a suitable candidate is found. More information here. The National Environmental Education Foundation’s Every Day Capacity Building Grants provide Friends Groups with up to $5000 to help build their organizational capacity to serve public lands. Deadline is next Monday, April 23. Learn more here! The NY State Department of Agriculture and Markets is allocating $500,000 to support community gardens, school gardens and urban farms, with $25,000 available per eligible project,via the Community Growers Grant Program. Contact Meg.McCabe@agriculture.ny.gov with any questions by Monday, April 30 at 4:30pm and everyone’s questions and answers will be posted by May 2. All applications must be submitted through Grants Gateway; these helpful video tutorials walk through pre-registration and applying via Grants Gateway. More info here. Partnerships for Parks’ Parks Build Healthy Communities Grant provides $5000 for physical improvements, events, and programming in parks that contribute to community health and well-being. While they give priority to groups that live, work, or volunteer in Corona, North Corona, Flushing, and East Flushing, this grant is open to any group or organization city-wide. Deadline to apply is May 1 at midnight. More info here. Check out our list of other micro grants and resources that can help you make your project a reality after you have access to your lot or building. This Saturday will be an afternoon of dancing, day drinking, and connecting with NYC’s community land access advocacy organization to celebrate Earth Day Weekend in Crown Heights, with 8% of proceeds going to 596 Acres. What could be better? We will have DJ E.O. spinning tunes, a signature cocktail, and snack platters for you to enjoy. All ages welcome and the venue is wheel chair accessible. Special thanks to Ode to Babel for partnering with us! Event info here. RSVP and invite your friends and fam on facebook here.